The WRARC held it’s regular monthly meeting at the American Legion building in Danville. Those in attendance were: KG4UQL, KA4SWT, KG4VCR, KB4UPW, KM4QOY, WQ4Z, KE4INO, KI6SEP, KI6SER, KF4FMQ, KY4KD, KD0HYA, AC4NE, W9WA, N4JCT, KJ4ND, K4FT, KY4RW and KM4TPW. the motion and all members approved. Mike asked for a treasury report. Bill W made the motion to approve the report. Dan L 2nd the motion with all members approving. was loud and could have been turned down some to be able to enjoy. Ken said it will not happen next year. Mike said it looked like all the things on our list to bring was there with more. Mike also mentioned that we were on the front page of the paper, and was a very good write up. George C said he would like to send a letter to the editor to thank them for covering our event. Members said that would be a good idea for him to go ahead. This event started out slow for the first few hours then picked up. When all was done in this 12 hour event we scored over 27,000 points. Know we wait to see how we did. The special event that was done on Memorial Day weekend was slow and that was due to a three day weekend. We wound up with 16 contacts from 6 states. Mike asked when the next event was. Ken said the next on the 14th of June this is the HF World Championship. The events are listed on our web page. close since the building manager wanted them to be closed. Chris said the coax thing was already being looked at but the power thing will have to be studied. John W said for those that have built their kits he has some updates and upgrades he can help them with. These will help with some of the problems that people have had. Ken drew for the club legion hat which Bernie H was the winner. Then drew for a Yaesu hat that Ken brought back from Dayton Hamfest. The winner of this was Janie. We will have another drawing next month for more. Yes you have to attend to win. the building for this event. Ken said that there is a Post Service Committee that is being looked at that can help lower the Associate dues but that is a work in progress so more to come on this. Mike asked if there was a motion to close the business portion of the meeting. Janie made the motion Dan 2nd the motion and the business meeting closed at 8:10pm. Andy had some pics and video of field day that he shared with the members in attendance. This entry was posted in Club Information. Bookmark the permalink. The next meeting will be held April 23, 2019. The meeting starts at 7:30 pm. The before meeting dinner will start at 6:00 PM located at ???? in Danville. WRARC members meet 9 AM once a month on a Friday. It will be at the Red Rooster (AJ’s) Diner on Main St. Danville past constitution square and before post office on same side. Next Club Social will be May 10th. Everybody is invited to come. Always check the weekly net for the latest updates. 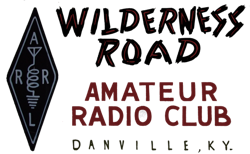 The WRARC holds a Net each Wednesday at 8:00pm local time.